My absolute favorite skincare discovery is the power of snail mucin. I wish snail products had been on the scene when I was on Accutane, because snail mucin is perfect for healing irritated skin. I’ve already mentioned this snail essence, snail eye masks, and snail steam cream, but now for my latest obsession on the snail scene: Snail sheet masks. 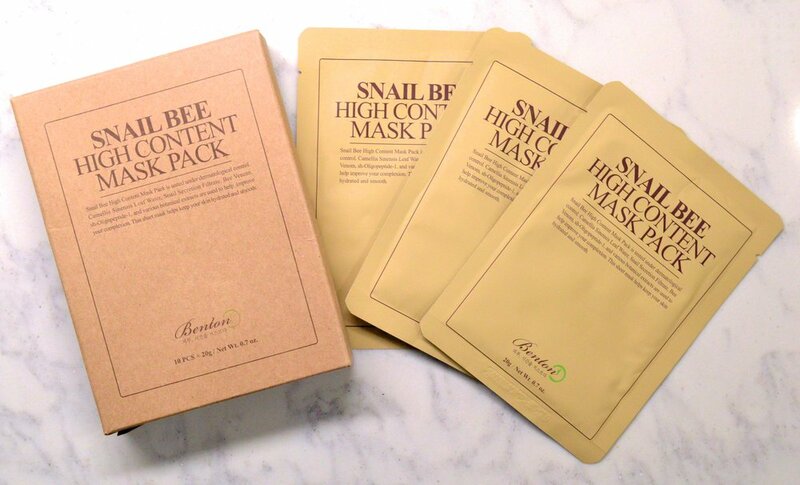 Benton is the company behind my beloved Snail Bee High Content Steam Cream, and they also make a Snail Bee High Content Mask Pack, which puts the power of snail mucin in a mask form. I’m generally much more into wash off masks than sheet masks, but with a moisturizing mask like this one I can work it into my routine easily. I use two products from my dermatologist at night, and when I use this mask I put on my prescription potions, wait at least an hour, and then apply this mask and leave it on as long as I can. I’ll typically put on this mask and then read in bed until I get sleepy, and then just whip the mask off and toss it on my nightstand. When I wake up the next morning, my skin looks so good, I wonder why I don’t do this every single night (time and money, that’s why). I love this mask so much that I buy it in a box of 10. You can purchase these boxes of Benton Snail Masks from many outlets, but I find the best value is on Amazon, where a box is $16. To compare, the box of 10 is $25 on SokoGlam and $20 on Overstock. Another hot tip for any sheet mask, save the little packet they come in and use that leftover essence as a serum the next night, or even longer. I tend to squeeze my masks as I remove them from the package, so that they don’t drip all over the place but I’m not just squeezing them out over the sink. I had one Snail Bee Mask that ended up lasting me three days: Day one was the actual mask application, and then next two nights I used the juice that was left in the packet as a serum. If you also use the aforementioned snail essence and/or the steam cream, you’re set for some super snail treatment - and gorgeous skin when you wake up the next morning.